Thousands of Venezuelans defied the closing of the border with Colombia and broke through security barriers to enter the neighboring country on Tuesday. According to newspaper La Opinion from the border city of Cucuta, the Venezuelans ignored border patrol officers, tore down barriers and climbed over parked shipping containers to reach the border after 11AM. 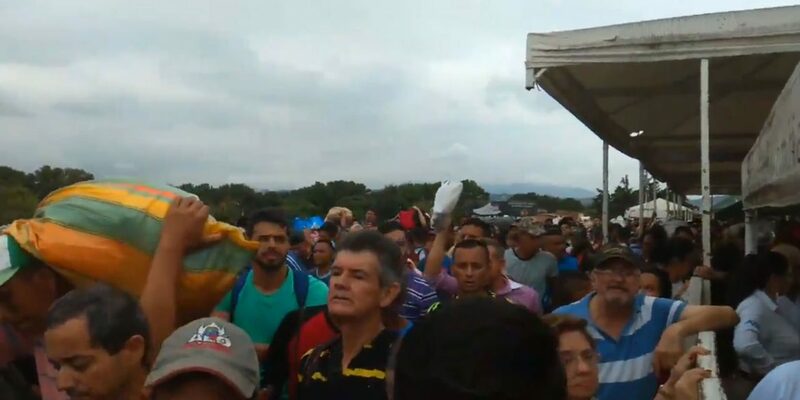 The chaos erupted after rising waters of the Tachira river that divides the two countries flooded trails that allowed residents of the border region to reach the other side of the border illegally. The barriers and had been put up by Venezuela’s border authorities in February after a failed attempt to force American aid into the country that is suffering one of the worst economic and political crises in its history. “The National Guard blocked the way for us, so we decided to climb over the containers. I crossed to buy food and we are waiting for the river to descend to return to the trail,” an anonymous woman told La Opinion. Gaby Arellano, a member of the opposition-led National Assembly, shared video of the chaos at the border on Twitter. Colombian police rushed to the border to prevent chaos on their side of the border. Venezuela has been suffering severe food and medicine shortages for more than a year and political polarization between the increasingly authoritarian Nicolas Maduro and the opposition since the president took office in 2013. The Red Cross announced last week that it would facilitate the entry of humanitarian aid to alleviate the crisis in Colombia’s neighbor to the east that has spurred the migration of more than 3 million Venezuelans over the past years.